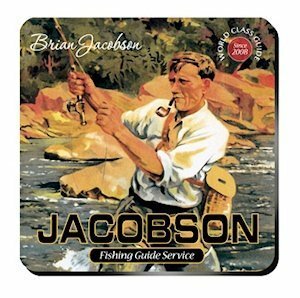 Avid anglers will love this old-fashioned fishing-themed coaster set, complete with a fun image of a vintage fly fisherman and a bit of fishing philosophy. This personalized coaster set dubs its owner "a world-class guide" and touts the wisdom of spending some time out on the water. Personalized with first and last name and established date, this coaster set makes a perfect retirement gift or looks great in a mountain cabin! Includes 4 coasters and caddy for storage.